Dr. Charles (Chuck) M. Croner, retired geographer, survey statistician, and editor at the US Centers for Disease Control and Prevention (CDC) was inducted into Urban and Regional Information Systems Association (URISA) GIS Hall of Fame during the 2014 GIS-Pro Annual Conference held in New Orleans, Louisiana, in September. 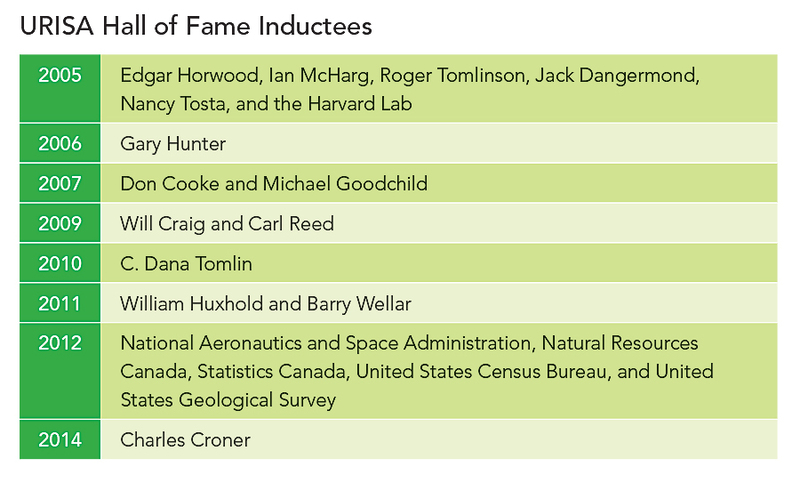 The GIS Hall of Fame honors persons and organizations that have made significant and original contributions to the development and application of GIS concepts, tools, or resources, or to the GIS profession. Croner majored in geography and received his bachelor's degree from Towson University and his master's and doctoral degrees from Michigan State University. He studied statistics at Harvard University. Prior to graduate school, Croner served as an infantry officer as a captain and helicopter navigator in the US Marine Corps. "The military served to advance my geographic foundations, both through formal land and air navigation instruction, and instill in me an indispensable perspective of mapping in dynamic time and space. Although only several professional geographers were employed at the CDC in 1972, Croner positioned the CDC as a leading agency in GIS and public health. "I believed CDC's outstanding reputation for medical intervention, including lifesaving vaccines and the prevention of costly infectious and chronic diseases, could benefit further from the inclusion of geography into the emerging multidisciplinary CDC approach to public health science. The timing could not have been better." Croner was the founding editor of the bimonthly digital newsletter Public Health GIS News and Information. Published from 1994–2006, it helped establish the CDC as the lead agency and focal point for the timely dissemination of GIS and public health-related developments worldwide. Although it was initially designed for CDC staff, its readership grew to include most state and local public health departments in the United States as well as an extensive international audience. Through the newsletter, the role of geography at CDC reached nationally and across the globe. The newsletter was recognized by Esri with a Service Award in 2007. Croner was the first Department of Health and Human Services (HHS) representative to the Federal Geographic Data Committee (FGDC), where he served with distinction and guided HHS to member status. He is responsible for the successful development of federal GIS interagency agreements with the US Bureau of Census, the US Geological Survey (USGS) and the US Department of Housing and Urban Development to leverage geospatial investments; create the first long-term collaborative small area GIS study of minority health between CDC and Cleveland's Center for Community Solutions (CCS); and contribute to the planning and instruction of the USGS Historically Black Colleges and Universities (HBCU) Summer Faculty GIS Workshops program. He was tasked by the CDC to help design CDC's first Enterprise GIS Roadmap. At the CDC, Croner also created the first GIS Awareness Week, the Cartography and GIS Guest Lecture Series, the Public Health GIS Users Group, and the Internet GIS Guest Lecture Series. Croner received many awards from government, academia, and the CDC, especially for his work with GIS and minority public health disparities. 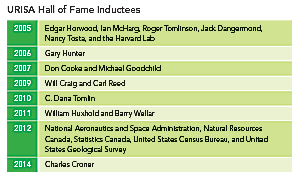 Visit URISA's GIS Hall of Fame to learn about the accomplishments of all inductees.